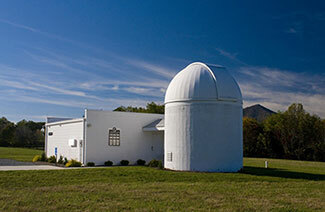 Belk Observatory now offers evening educational programs for high school and college groups. Our curricula promote science literacy, engage students in hands-on learning, and integrate newly released VDOE SOLs for astronomy, earth science and physical science classes! We keep our programs small in order to foster learning and interaction. Program fees include 1.5 hours of dedicated instruction from a Belk staff member, including viewing through telescopes when weather permits. The first half an hour of the program will be a topic-specific presentation and discussion, and the remainder will be using the tools and equipment available at Belk to observe the night sky. Viewing objects are very dependent on weather, time of year, and moon phase. Most educational programs are scheduled during the winter months from November – March, after daylight savings time ends and before it begins again. Star Formation and Stellar Objects: Explore the universe from the beginning of detectable time and space, and learn about different galaxy types. Dive into a molecular cloud where stars are born, and discuss the different stages of star formation and the stellar life cycle. During the observational portion of the program, identify and focus in on stellar objects like a star cluster, galaxy, or interstellar cloud. Planetary Systems: Delve into the stage of stellar evolution where a protoplanetary disk forms and discuss the types of objects that can be found in a planetary solar system. In addition to a brief overview of the planets, learn about some of the past and ongoing science missions that explore the characteristics of the planetary objects around our own Sun. During the observational portion of the program, identify and focus in on planetary objects like the moon and a neighboring planet, or perhaps a satellite or meteors. Astronomical Instrumentation: Understand how to use the sky as a tool of navigation and time-telling. After a brief overview of the electromagnetic spectrum, discuss and explore some of the different technologies that humans use to detect astronomical objects. Learn how spectral signatures can help identify chemical compounds and also measure temperature, distance, and age of an object or region. During the observational portion of the program, explore the inner workings of a basic telescope, and help align some of our scopes at the observatory to view objects that are within view. Customizations considered: If you have an interest in learning more about a particular topic during your visit, we are able to consider custom requests. Please indicate your interest on the request form. *Inclusion of more than 20 students or 23 people must be arranged in advance and is not guaranteed. Over-capacity groups may be split across two nights of instruction and incur additional fees. Evening activities may be subject to change according to weather conditions, but overall, our programs are designed to run in clear or cloudy skies. In many cases, cloudy winter afternoons turn into clear evenings. In the case of anticipated severe weather, your program coordinator will determine a course of action two to three hours in advance of your program. We will do our best to make a call in your viewing favor.